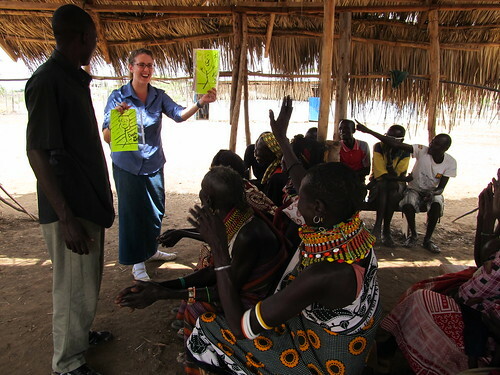 Karen Morrison leads one of the seminars while in the Turkana region of Kenya. Some of the nomadic, native Turkana walked two days just for teaching seminars, with the intent of returning to their tribes and sharing what they had learned about Orthodoxy. Within the Turkana lives not only a heartbeat of survival and a foot-stomp of joy, but a soul that trills the hope of the risen Lord. Orthodox Christianity is alive and well in the cracked, mystic terrain of northern Kenya. The Turkana people proclaim the Trinity with the faith of a child and with the wisdom of an elder. Through the tireless love, support, and efforts of local parish priests, the committed connection of the Orthodox Christian Mission Center, and the willingness of many to receive the Gospel, the one true faith has united over 10 communities of believers. I was accompanied by a team of 7 incredible individuals to Kenya. It took no time at all to give ourselves the team name “Turkana Saba” (Saba= seven in Swahili). Strangers for but moments, we were a pan-Orthodox melting pot from Washington to California to Virginia to New York to Russia, and a few spots in between. The support and prayers of family and friends brought us together to the OCMC headquarters in St. Augustine, Florida. The passionate, dedicated OCMC staff readied us with lesson plan guidance and enlightened us on the Great Commission: "Therefore go and make disciples of all nations, baptizing them in the name of the Father and of the Son and of the Holy Spirit, and teaching them to obey everything I have commanded you. And surely I am with you always, to the very end of the age” (Matthew 28:19-20). Eager and nervous (because after all, when do you really say, “Okay, now I’m ready to go to Kenya”?) we flew to Amsterdam, from there boarded Kenya Airways to Nairobi, and hopped on a puddle-jumper to Lodwar. Over thirty hours of travel left us worn out but ready. Our team stayed in the modest quarters of a Catholic guest house, which provided just fine for our needs of praying, journaling, eating, sleeping, lesson-planning, and socializing. We became experts at spraying bug spray, repairing holes in our mosquito nets, rationing toilet paper, eating cabbage and potatoes, checking for frogs in our bathroom, hand-washing laundry, taking cold showers, using water bottles to rinse after brushing our teeth, walking with flashlights at night, dodging bats, spiders, and small scorpions, and riding in the bed of the pick-up truck that served as our transportation as our drivers zoomed past pot holes on the dirt roads of the town—it should be the next ride at Disneyland! The focal point of our mission work was teaching at St. John the Baptist Orthodox Church, just outside of Lodwar. The building itself and the water well beside it were projects of OCMC and continue to be a well-spring of life for the Turkana people. We had two teaching sessions while there—one for adults and one geared toward children. Some of the nomadic, native Turkana walked two days just for our teaching seminars, with the intent of returning to their tribes and sharing what they had learned. It makes one stop and pause: would I go to such great lengths for Truth? We had 3 concurrent teaching sessions, each with a priest/translator. My teaching experience in a Title I school with a large population of ESL students, predominately refugees from Africa, served me well in this capacity. I acted as teaching coordinator for the group—determining what got taught and where (location choices: the church building, a grass hut, and a metal shed that we affectionately referred to as the “Tin Can”). Our teaching topics included various parables, death and its origin, salvation, saints, marriage, sacraments, the Creed, transformed life in Christ, Orthodox parenting, etc. We were quite surprised both at the prior knowledge of several of the people and at the lack of knowledge of others. If there had been any schooling at all, the people were most familiar with lecture style, but we pushed many out of their comfort zone by asking questions, making crafts, and requesting them to participate in dramatizations. Watching the priests teach their own people was amazing, as their teaching exemplified the pure art of story-telling and total engagement with the content through voice inflection and gesticulation. Anytime the people heard something they liked or that resonated in their spirit, they’d stand, clap, and jump up and down in joyful tempo—in the middle of a lesson, as a stretch break after a lesson, during Liturgy, all the time- constant expressions of joy. In lieu of formal school supplies, I brought cardstock in sheet protectors to make dry erase boards. When I asked one group to draw what comes to mind when they think of a saint, an old woman started laughing because she’d never held a marker or pen before. Communion—hands down- the most emotional, transformative experience; as soon as the Gifts come from behind the iconostasis, the beating of a drum, trills, laughing, smiling, jumping fill the space of the church building—they knew it was the Body and Blood. They knew it was life-giving. They reminded me of what I often forget to remember, and their reaction to receiving these precious gifts made nothing but total sense. Tears streamed down my face—unforgettable! Listening to and watching the different tribes perform for us in welcoming and closing ceremonies—amazing voices, young & old. The heart of every old spiritual song most definitely originated there. We performed for them too—“The Call,” “Oh When the Saints Go Marching In,” “In the Jungle,” “He’s Got the Whole World in His Hands,” along with Orthodox hymns.